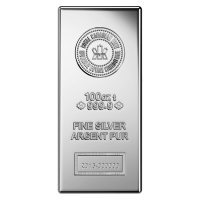 30 غ 2019 عملة فضية الباندا الصيني When you visit our store and order a 30 g 2019 Chinese Panda silver coin, we’ll give you the best prices on the net. This coin takes its place among a long running and remarkably popular series, the Chinese Panda range, minted at several of China’s leading mints and enjoyed by collectors since 1982. The reverse design, which has a fresh face with every year’s release, is an endearing portrayal of a mother Panda lovingly embracing her young. Also on the reverse is the coin’s denominational value of 10 Chinese Yuan, as well as its purity and weight, which is now shown in metric to cater to the international market. The obverse feature is a familiar sight to collectors of the range, as it’s been the same since 1982; a meticulous etching of the ‘Hall of Prayer for Abundant Harvests’ in Beijing, located at the ‘Temple of Heaven.’ Included on the obverse is the legend of ‘the People’s Republic of China,’ displayed in the native script; as well as the coin’s year of release, 2019. Although the Chinese Panda series has been minted since 1982, the silver range only came into production the following year, in 1983 and also skipped a release in 1986. 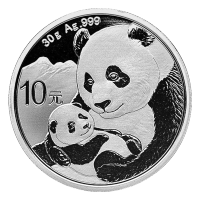 The giant panda is widely regarded to be one of China’s national treasures, take your piece of the treasure home and diversify your portfolio with a 30 g 2019 Chinese Panda Silver coin today.